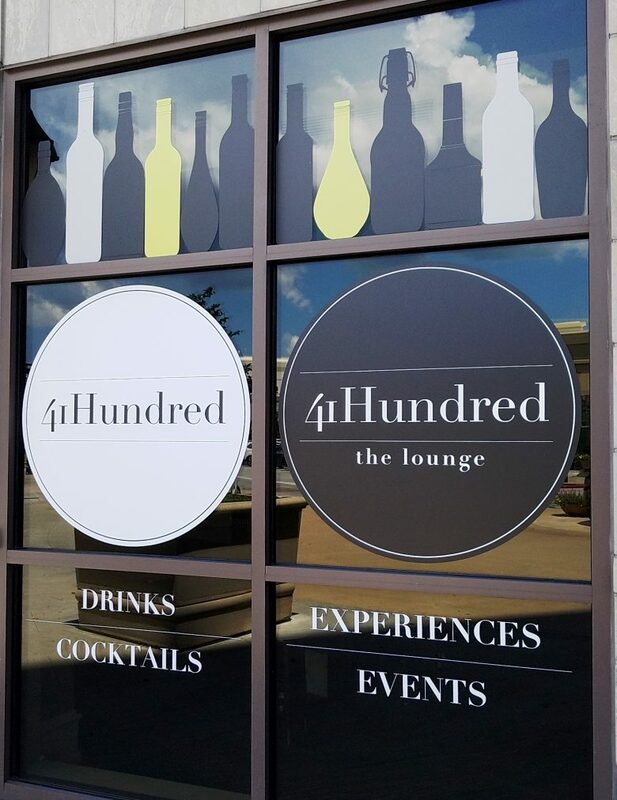 When I first entered 41Hundred, which sits on the first floor of the Renaissance Hotel, I didn’t recognize the place. 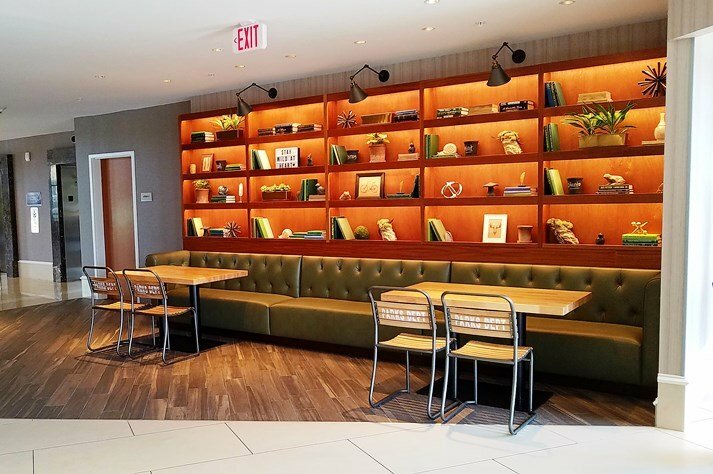 Gone were the 25′ ceilings with fabric wall-hangings from the old Flights. 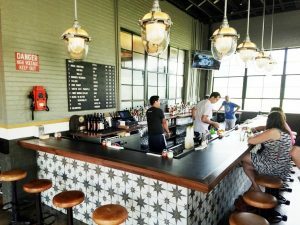 In was a funky looking bar with urban mural and a lot more. I met up with Kristen from Tabletop Media Group who was hosting the event from a PR perspective and the 41Hundred team, including Chef Dean Thompson. I first ran into Chef Dean years ago when he won two of the Fire in the Triangle competitions in 2013 and 2014, so you know he’s got some talent in the kitchen. 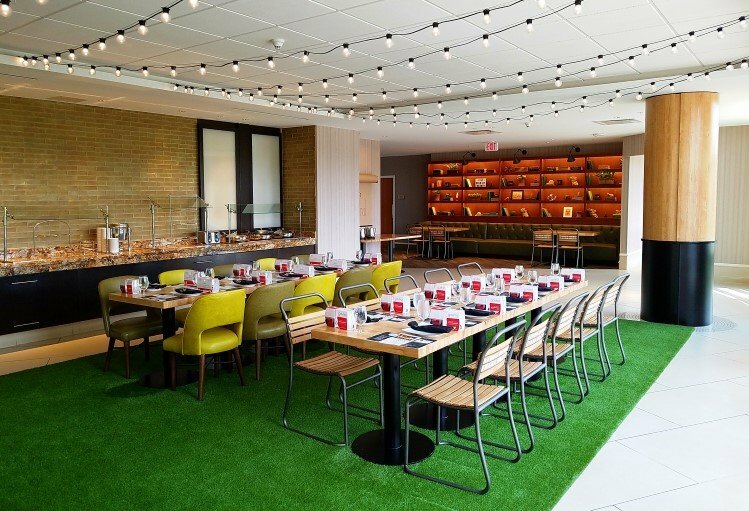 Peering around the corner, I spy a retro looking dining room with artificial grass flooring, outdoor chairs, and patio lighting overhead. Past the main dining room is a modern nook area with a bookshelf library on display. The dining room feels very open and modern with a glass face shedding a lot of natural light into the space. 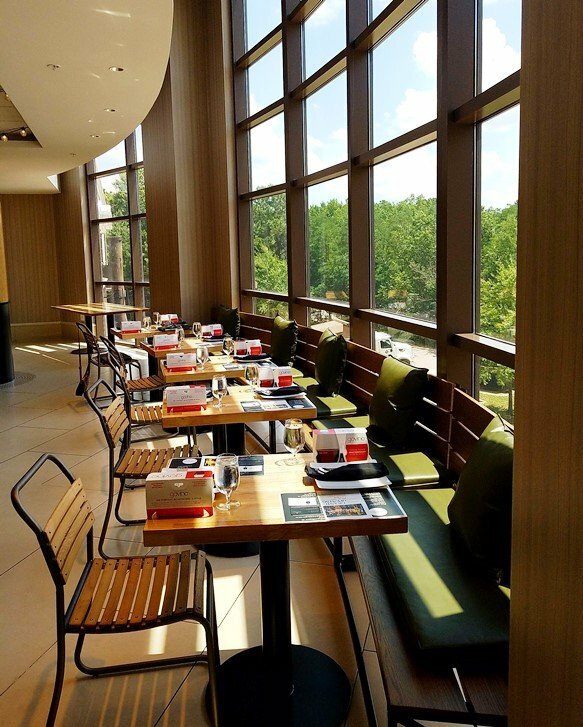 This is definitely not your typical hotel restaurant and dining area! We all gather round the tables set up for our media preview and Chef Dean takes us through the menu. 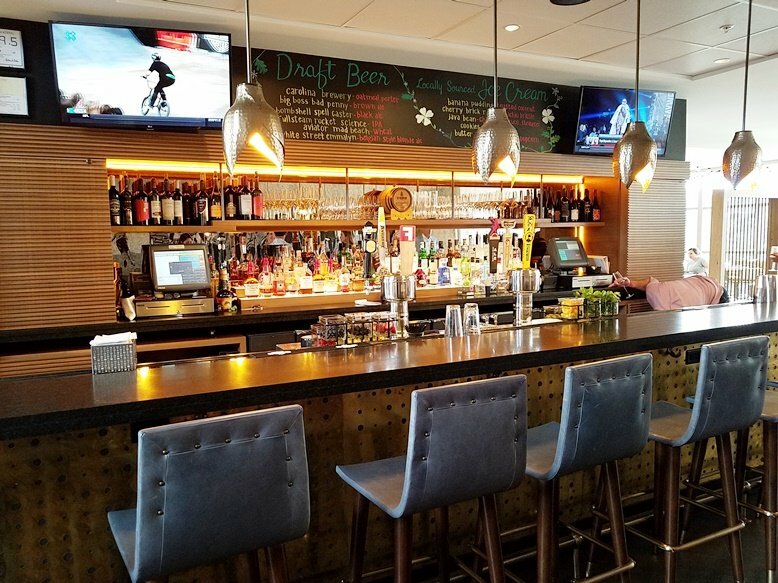 While 41Hundred offers breakfast, lunch and dinner, we’ll be focusing on their popular shared plates today. Scanning the menu, it all looks very reasonably priced with all the plates and sandwiches running from $10 to $15. The shareable plates cover a wide range of cuisine types, a very eclectic assortment of flavors! Note the plates pictured here are a bit bigger than normal due to the media event and need to share across a larger table. 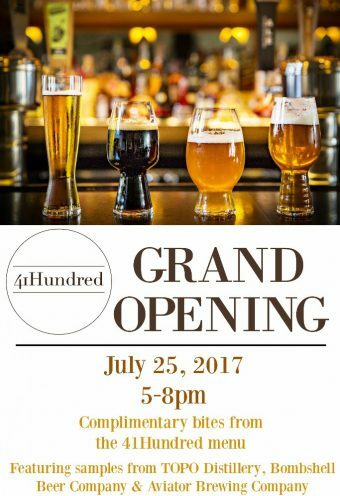 41Hundred has also amped up their beer and liquor selection by focusing on many of the great local options we now have in-state. 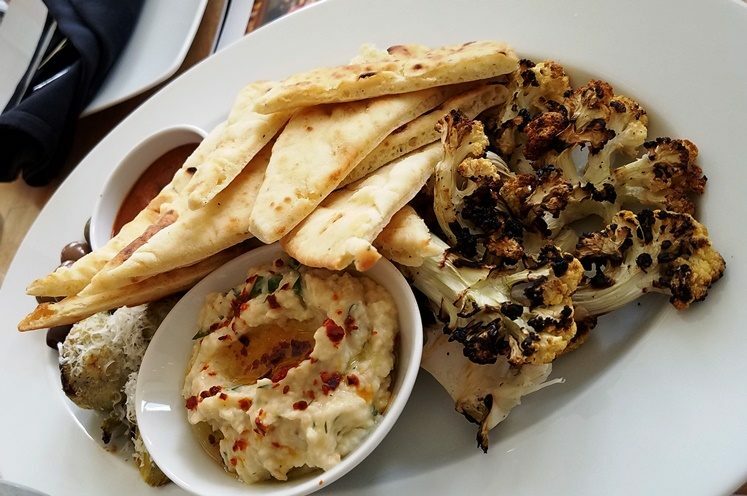 We start off with the roasted cauliflower plate which is served with baba ghannoush, pita, olives. 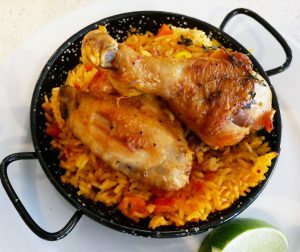 It’s a healthy and flavorful offering and the side of harissa (hot chili sauce) adds some spicy pop. Next up is the fried halloumi (semi-hard cheese) served with figs, almonds and heirloom tomatoes, very satisfying! There’s some chewy, crispy and and crunchy happening here and the tomatoes show off a wonderfully crimson skin. If you’re a vegetarian, these are the best options for you out of the shareable plates at 41Hundred. Next up is a lovely looking tuna poke plate! 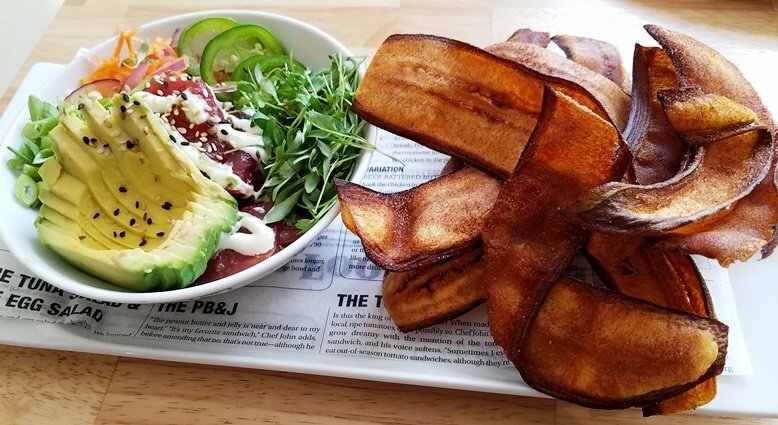 Served up with sliced avocado, wasabi aioli and plantain chips, you can keep the eats simple or add some heat by including jalapenos with your bite. A plate of crispy wings show up on the table. 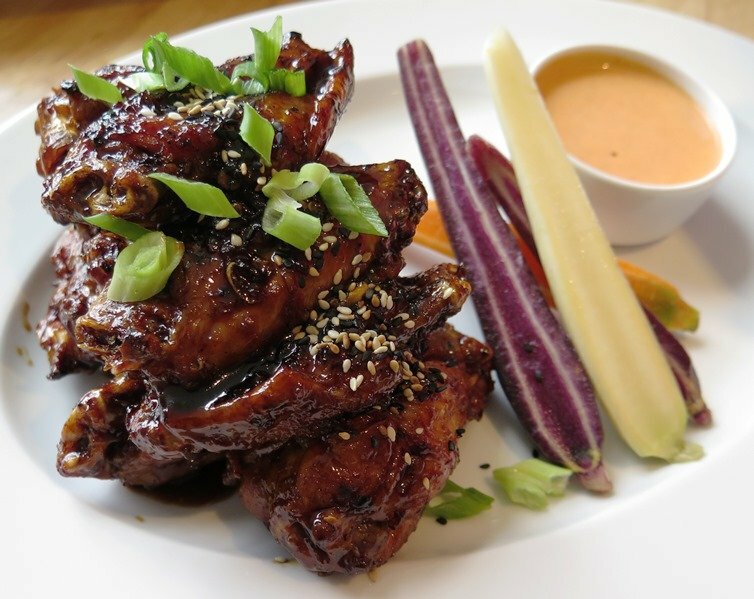 A heaping pile of flats and drums slicked with a sweet crispy crunch, these Korean BBQ wings could be very addictive! There’s some sriracha aioli for wing dipping if you’re in the mood. 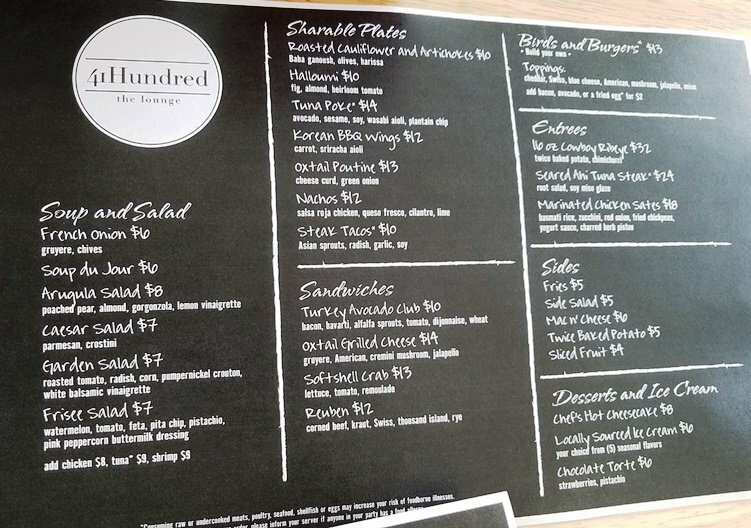 Now we’re deep into the meats on the 41Hundred menu. A plate of tender steak tacos disappear quickly (missed a picture) and then the piece de resistance for me, oxtail poutine! I’ve been on a bit of a poutine kick lately. Popular up in Canada, we’re talking about fried covered in gravy and cheese curds, a real meat and potatoes type dish. 41Hundred goes with a luscious oxtail meal and deep brown gravy with chunks of that cheese curd atop. A sprinkle of chives fills out the plate and it is dee-licious! The oxtail meat is super tender and has that mouth-feel given the fat and collagen in this cut. A great use of tender meat and potatoes here, in my opinion! We finish off the media tasting with Chef Dean’s famous hot cheesecake! 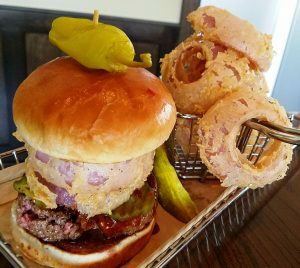 This closely guarded recipe was handed down to him from the previous executive chef he worked under and after one taste you’ll understand why. 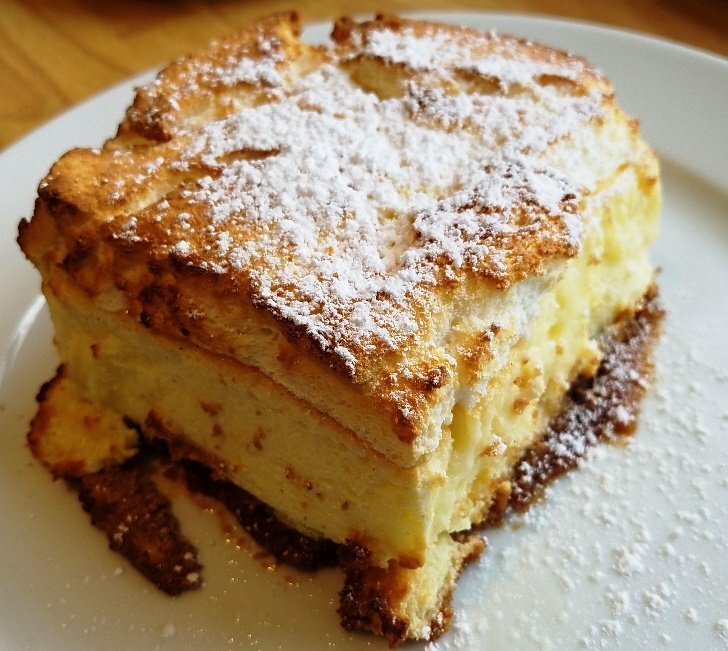 The hot cheesecake is light, fluffy with some lemony tang and offers a nice contrast to your typically dense, cold cheesecake. I’m normally not a fan of cheesecake due to its density and texture but this hot cheesecake is eye-opening. 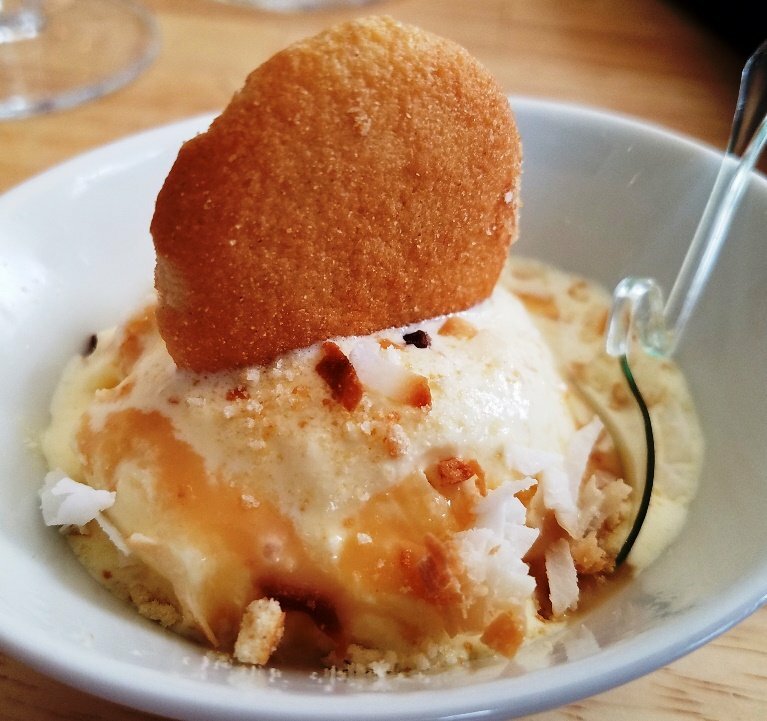 And a small serving of banana pudding is wonderfully put together with a drizzle of caramel syrup and toasted coconut flakes.